Infrastructure development is seen as key to economic growth. ‘Developing countries’ like India start many infrastructure projects to boost its regional development. But since few days, we are watching news of collapsing these infrastructures. Who is responsible for the same? Who is going to pay back losses? And when we will get infrastructure ready? These questions are really important. 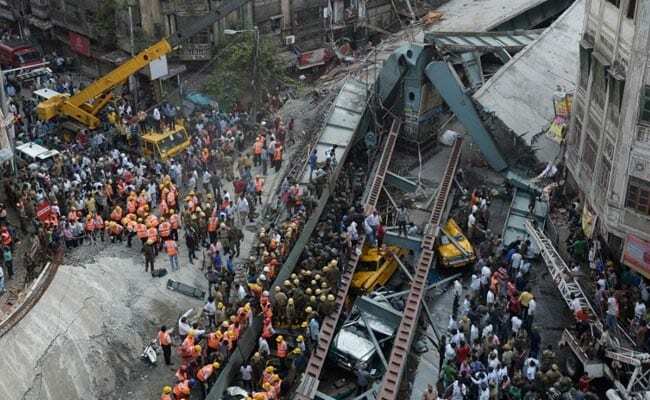 On 31st March, under construction Vivekananda flyover in the Girish Park, Kolkata collapsed. Around 27 people were killed and more than 50 injured in the accident. Going into its background history, This 2.2 Kilometre Bridge was supposed to be completed in 2010, but it missed its deadline 9 times. The contractor of the bridge, IVRCL has been already banned by Government of India for different incidents of non-performance during the process of bidding collapsed flyover in 2007. Now everyone is accusing previous government and company officials instead of asking the simple question why the contract was given to IVRCL having a bad record? The simple answer is “Corruption”. Leaders, to whom we elected to serve us, made a deal with our lives. Now today, Under construction metro pillar collapsed in Lucknow near Alambagh Bus station. The interesting thing about this tragedy is that, 1 week earlier concrete broken from construction structure fallen on one car, and a week later it collapsed leaving several people injured. To meet December 2016 deadline contractor is risking lives of people. Though infrastructure is necessary to be completed on time but safety is more important. We are living in a phase wherein every two months we see one new construction work in our city. We adjust to inconvenience which causes during its development hoping we will get good future. And when structure fails do so, we ask for accountability? Does anyone take responsibility? – ‘NO’. So being new age citizen we should speak about delayed construction and faulty structure with concern departments for our safe future. Have something to add to this story? Share it in the comments below.